Matthew Thomas Skiba is the lead singer and guitarist of Alkaline Trio. He has previously been a member of various bands including Jerkwater, Blunt and The Traitors. In 2002, Skiba recorded a split EP with Kevin Seconds. In 2006 Skiba was in a side project with F-Minus bassist Josiah (Joe) Steinbrick named Heavens which debuted their album Patent Pending on September 12th. Born in Chicago on February 24, 1976, he moved to the suburb of McHenry, Illinois at the age of three. Playing drums at an early age, his first concert was Public Image Ltd. But in 1996, while working as a bike messenger, he decided to take up the guitar. Skiba dropped out of art college to form Alkaline Trio with drummer Glenn Porter and bassist Rob Doran. Matt Skiba is a vegetarian and holds a membership card to the Church of Satan. His central influences include punk groups such as The Ramones, The Misfits, and The Damned, Naked Raygun, Pegboy and Jawbreaker as well as 1980s new wave/gothic rock groups like as The Cure, Sisters Of Mercy and The Psychedelic Furs. He now resides in California with his wife, Monica Parker, whom he married on August 7th, 2005. Skiba's latest project Heavens released their debut album "Patent Pending" on Sept. 12, 2006. His mother, Joan Skiba, is a 4th Grade teacher in Crystal Lake, Illnois. 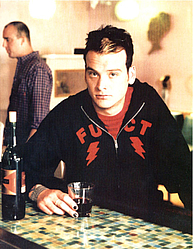 Skiba remains the only original member of the Trio (they suffered several lineup changes that ultimately resulted in the addition of bassist Dan Andriano and drummer Derek Grant). Alkaline Trio signed with Vagrant Records in late 2000 and released From Here To Infirmary in 2001, Good Mourning in 2003 and Crimson in 2005 to mixed reviews. Skiba is also an active solo artist; in addition to the split with 7 Seconds' Kevin Seconds, he contributed to Fat Wreck Chords' 2005 compilation Protect: A Benefit For The National Association To Protect Children with the song Demons Away. In September of 2006, his side project "Heavens" was released and started to tour. Also in 2006 Skiba contributed to the "Rock 'n' Roll High School" track that appears on the "Brats on the Beat: Ramones for Kids" tribute album released on Go-Kart Records. Subscribe to Matt Skiba RSS Feed to get latest lyrics and news updates. What do you think about Matt Skiba? Let us know in the comments below!